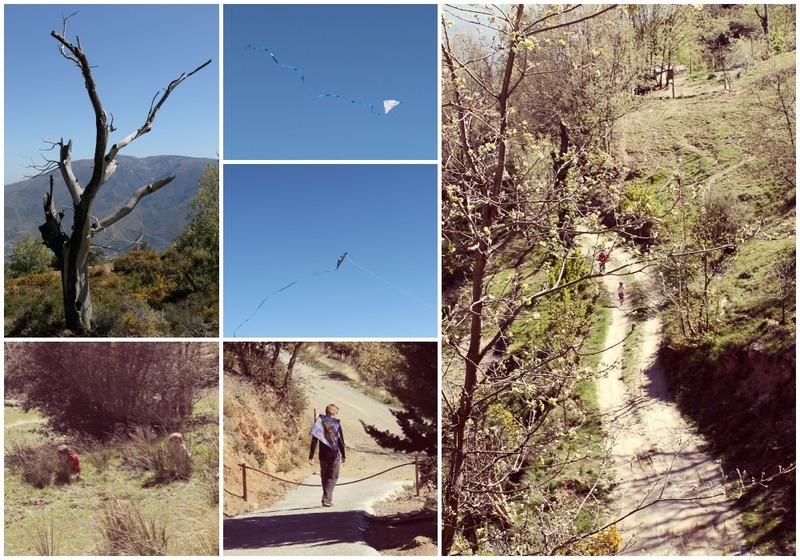 Recently we passed an afternoon up on the mountain, above the Alpujarran village of Cáñar, with friends who live there. The plan was to go fly a kite. My daughter, LB, had been very specific in her request to her Granny for una cometa – a kite – for her 4th birthday. She’s a girl who knows what she wants and she has wonderful, obliging grandparents. She got nearly everything that she wished for on her birthday, including la cometa. So, for kite flying, you need space and wind, and some able-bodied men and women… because four and five year olds are quite frankly rubbish kite flyers with the attention span of gnats. When it comes to carrying kites, flying kites, untangling kites from trees or even observing actual kite-flying they are no help at all! It seems that they would rather talk to donkeys, ride dogs and hide in the bushes. Here is a little look at how we got on, with a few scenic shots thrown in for good measure. As you can see, actual flying time was minimal. But really it didn’t matter at all. It was just lovely to be out in the mountains enjoying the space and the air with our friends. My daughter got to run and run and expend some of that energy that she has. Bedtime was easy that evening so I am all for more kite flying. If you are staying in the Órgiva area and up for the drive (not recommended in wet weather) the views out over the Med from this area are stunning and the air is amazing. Take the road out of the village of Cáñar (see map below). This involves a hairpin turn in front of Bar Piqui, that you should approach with confidence and care, even if there are a couple of folk from the pueblo sitting in the dappled shade by the church observing you. Continue along the Camino Forestal for a few kilometres (a 25 minutes drive) to a place called Puente Palo. This is a great spot to take kids in the Spring and Autumn. There you will find an area recreativa where you can stop for a picnic, walk up in the pine forrest and alongside the babbling acequia – irrigation channels – while catching glimpses of snow-capped peaks to the north and Sierra Lújar, Rules reservoir and the sea to the south. If you keep going beyond Puente Palo you will eventually descend and rejoin the A-4132 opposite a little white chapel, La Hermita del Padre Eterno, just east of the village of Soportújar. From there you can continue east deeper into La Alpujarra, towards the Poqueira Gorge and Trevelez, or follow the road west for Órgiva and Lanjarón. If you prefer to walk there is a 4 hour (aprox) circuit that follows the PR-A 22 towards Puente Palo and then joins a section of the GR-240 Sulayr long distance walking route on the way back down. You can start this walk on foot with a steep climb out of Soportújar (follow signs for the GR-7 and Caballo Park out of the village) or drive to the start of the circuit by taking the track opposite Padre Eterno up to a parking area (shortly after signs for the Caballo Park). Whether you decide to walk or drive, to fly a kite or not, this is a very special place to explore. If you have any questions or comments we would love to hear from you in the discussion box below. For more on the family activities that this area has to offer check out our post on Ten Things to do with Kids in Granada. Click on a location marker or click on the list below the map for more information. You can also drag the little yellow man from the top left corner onto the map to get a street view. This post is linked with the Coombe Mill Country Kids, a weekly linky celebrating getting out doors and having fun with your kids. Click the badge for more.